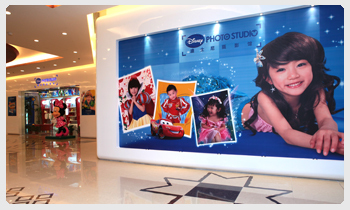 Shanghai Hengmin Science and Technology CO., Ltd. is the first Disney authorized professional photo studio for children. 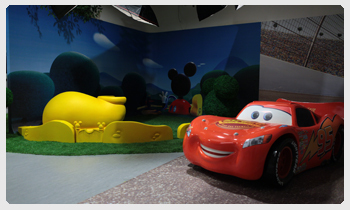 The studio opening ceremony was held on July 2, 2010 at Jinqiao International Plaza in Pudong. Hengmin was first introduced by the popular fashion program Channel Young, where several areas are available with numerous themes and backdrops to make any photography dream a reality. Hengmin’s success is completely reliant on the advanced printing solutions and processing techniques of Teckwin Technology. 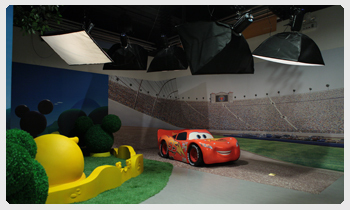 Teckwin combines vivid cartoon images and 9’x6’ superwide format roll-to-roll UV printing technology to create beautiful backdrops for professional photography sessions. Teckwin’s innovative printing solutions also utilize EZ boards for albums on building props to enhance the Disney photo experience. The arrangement for the studio is based on the concept of renewing popular tales and beloved cartoon characters to shape a distinctive Disney dreamland. 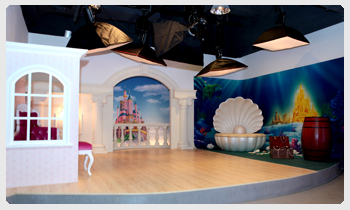 All the children who come to the photo studio will feel as if they are a part of their favorite Disney fairy tales, taking them to a wonderful land full of animated characters and fantasy.